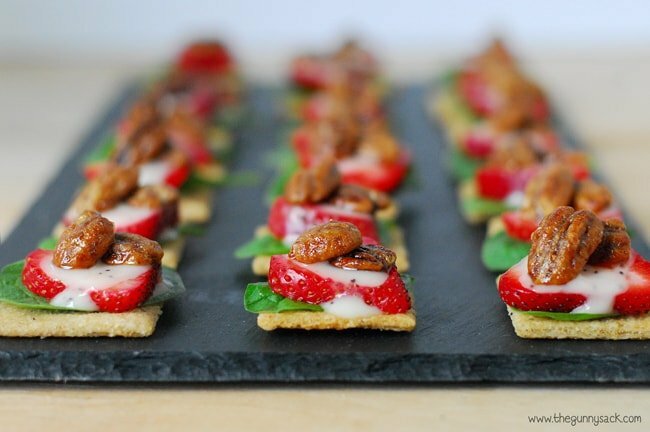 Strawberry Spinach Poppy Seed Bites are like everyone’s favorite salad in a delicious appetizer. These bite-size snacks are perfect for summer entertaining. Sponsored by Martha Stewart Living Omnimedia. I’m not sure who introduced me to strawberry spinach poppy seed salad, but it has been one of my favorites for years. I typically enjoy it at summer barbecues and celebrations, but forget to make it for myself at home. I love having fruit with greens and the combination of sweet and tangy. The addition of candied pecans just brings the flavor over the top. I’ve also had the salad with the addition of Mandarin oranges. 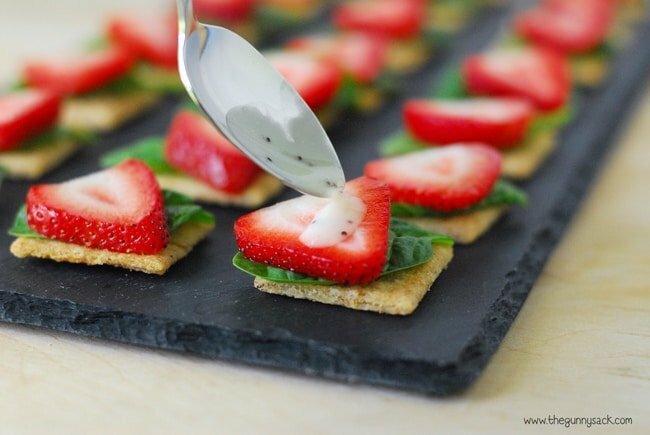 So for this summer appetizer recipe, I decided to use strawberry spinach poppy seed salad as my inspiration with baby spinach for my summer greens. 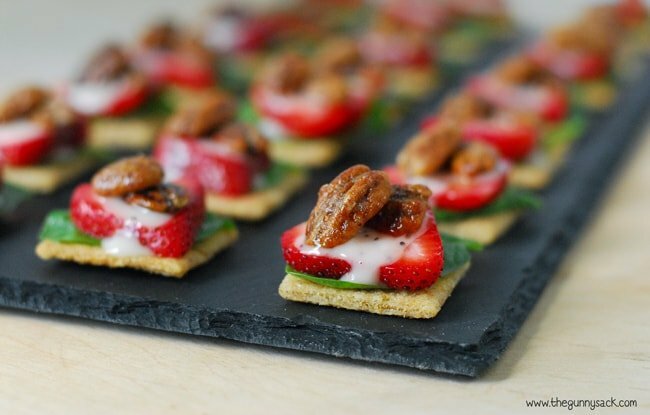 The ingredients are simple: Triscuit crackers (I used the brown rice sea salt & black pepper flavor), strawberries, candied pecans, poppy seed dressing and baby spinach. 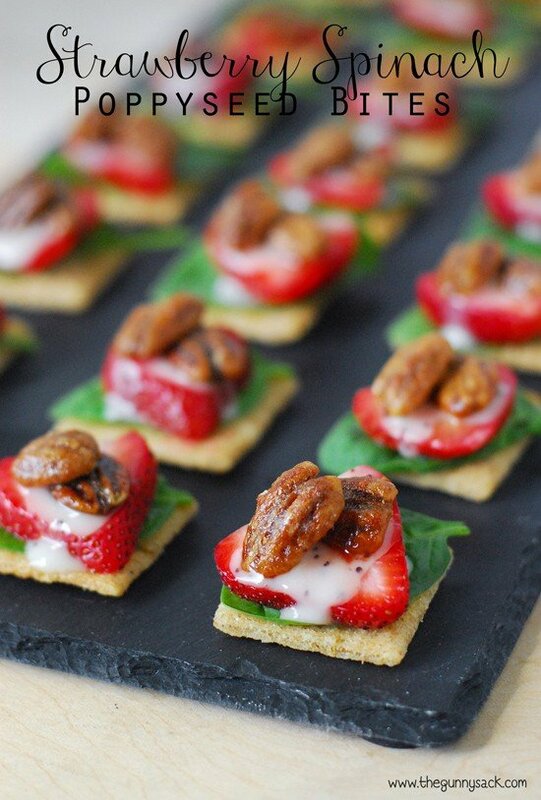 To make things easier I used ready-to-eat ingredients: organic baby spinach, refrigerated poppy seed dressing, bagged candied pecans and fresh, summer strawberries! But if you have recipes that you like to use for poppy seed dressing and candied pecans, feel free to use them instead. 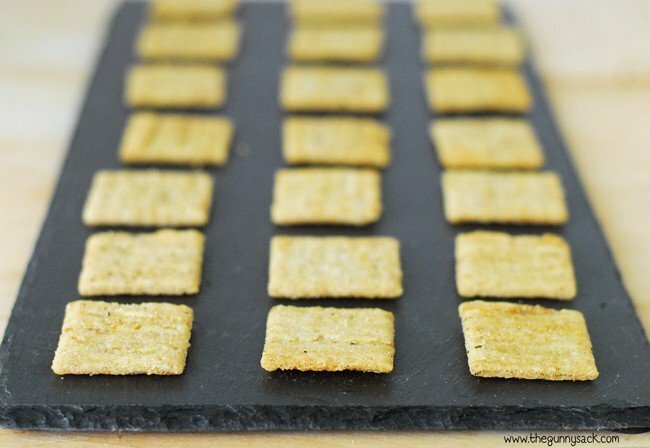 Line a serving tray with Triscuit crackers. 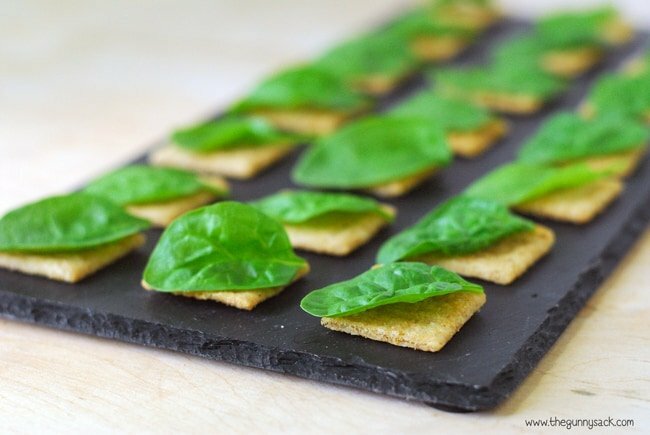 Top each cracker with a washed and dried baby spinach leaf. Put a strawberry slice on top of each spinach leaf and drizzle with poppy seed dressing. Top each one with a couple candied pecans. 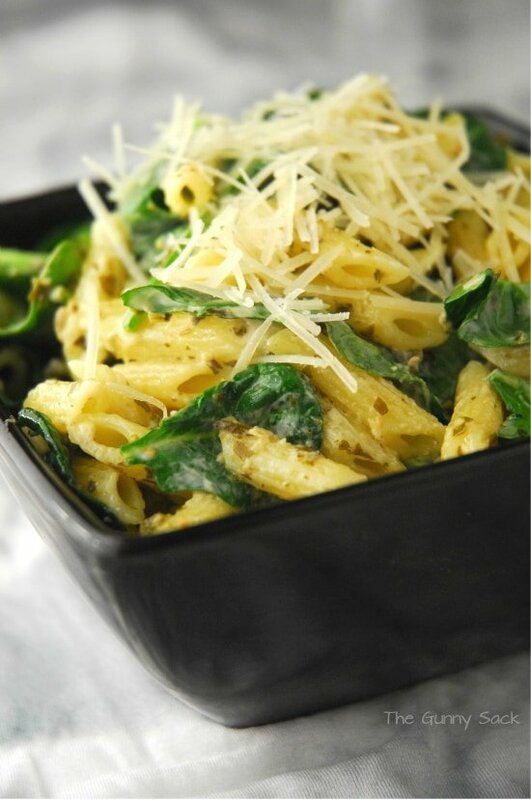 Make a few extra because you are going to want to sample them! 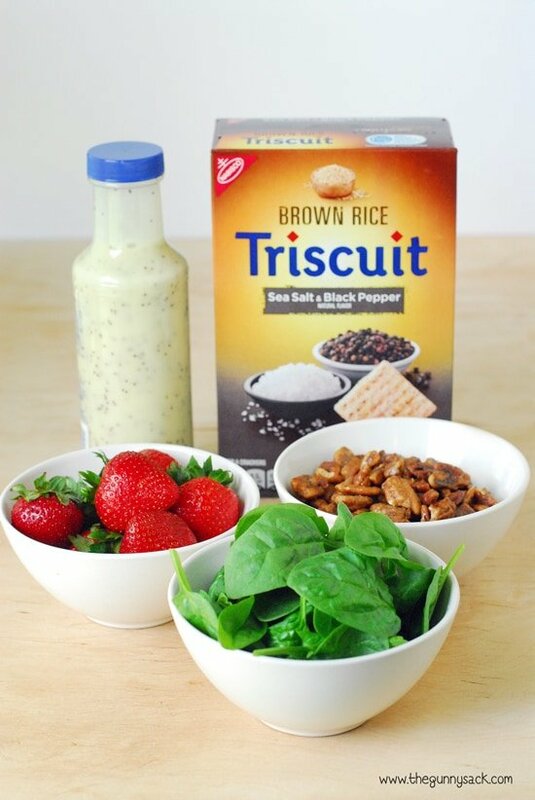 We shared these Strawberry Spinach Poppy Seed Triscuit Crackers with my sister and her girls. They were busy moving into their new house but took a break to try these snacks. Everyone loved them! 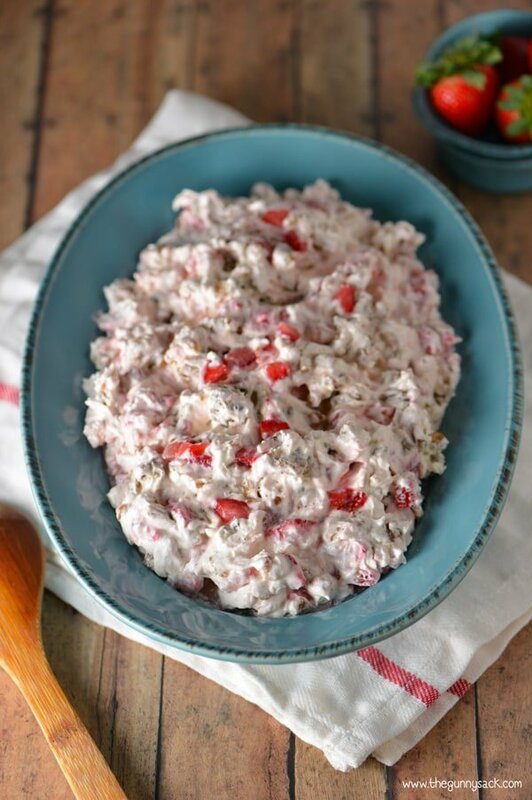 Strawberry Spinach Poppy Seed Bites are like everyone's favorite salad in a delicious appetizer. These bite-size snacks are perfect for summer entertaining. Wash and dry baby spinach and strawberries. 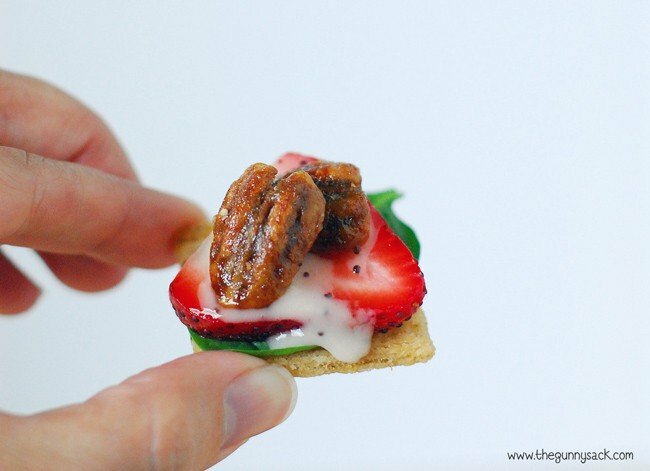 Cut the strawberries into slices so that there is one for each cracker. 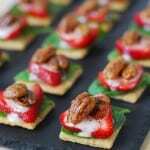 To assemble this appetizer, line a tray with Triscuit crackers. Top each cracker with a baby spinach leaf. Top with a couple candied pecans. This is a sponsored conversation written by me on behalf of Martha Stewart Living Omnimedia. The opinions and text are all mine.